With the warm weather outside comes my favorite type of date: outdoor movies. 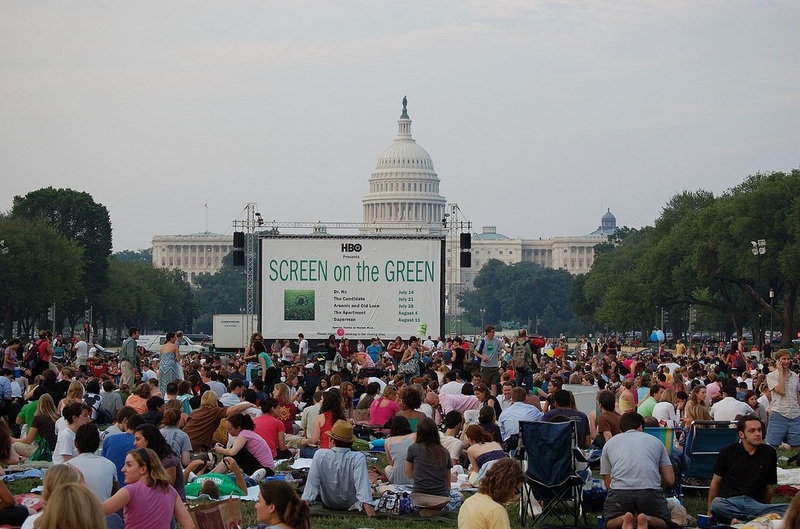 Although Screen on the Green is well-known, there are quite a few other options in the DMV that might be closer to your neighborhood or your favorite bar or restaurant. 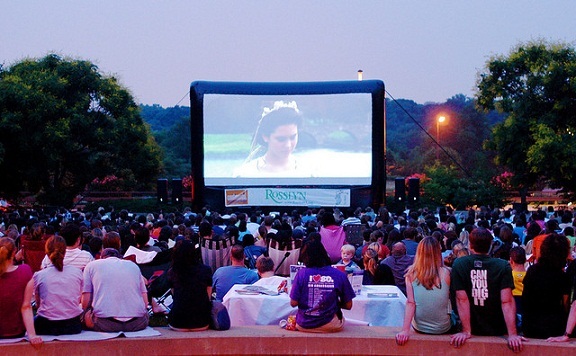 Screen on the Green is the most famous of the DMV’s outdoor movies. Shown on the National Mall at sunset (about 8 p.m.) on Mondays between July 22-Aug. 4, the films are shown on the Mall on a giant 20-foot by 40-foot screen between 7th and 12th Streets NW. Bring blankets, snacks, beverages, umbrellas, bug spray and warm clothes. You can pack snacks and non-alcoholic drinks for a picnic vibe. This year’s schedule includes E.T. : The Extra Terrestrial on July 22, Norma Rae on July 29, Willie Wonka and the Chocolate Factory on Aug. 5 and Tootsie on Aug. 12. Another great venue for outdoor films is Capital Riverfront’s Canal Park Thursday Movies. This year’s theme is, “It’s a Whole New Ballgame.” The first movie starts Thursday, June 5 at sundown with The Sandlot. The schedule also includes Happy Gilmore on June 12, Dodgeball on June 19, Wimbledon on June 26, Balls of Fury on July 10, Space Jam on July 17, Invincible on July 24, Bend It Like Beckham on July 31, Rudy on Aug. 7, A League of Their Own on Aug. 14, The Blind Side on Aug. 21 and Moneyball on Sept. 4. There are no movies on July 3 and Aug. 28. All Capital Riverfront movies will be shown at Canal Park, located at 200 M Street SE, down the street from Nationals Stadium. Nearby restaurants include Bluejacket Brewery, Osteria Morini and Park Tavern. You can also grab a coffee at Lot 38 or a cupcake at Buzz Bakery. Crystal Screen will be shown Mondays at sundown beginning Monday at 1851 E. Bell St. across from the Crystal City Metro station. This year’s theme is “In Flight.” Bring a blanket, these free films are shown rain or shine starting at 8:15 p.m. This year’s films include Airplane! on June 2, Drop Zone on June 9, Planes, Trains & Automobiles on June 16, Red Eye on June 23, Top Gun on June 30, Hot Shots! on July 7, Up in the Air on July 14, Con Air on July 21, Iron Eagle on July 28, Red Tails on Aug. 4, Executive Decision on Aug. 11, Flight on Aug. 18 and Snakes on a Plane on Aug. 25. 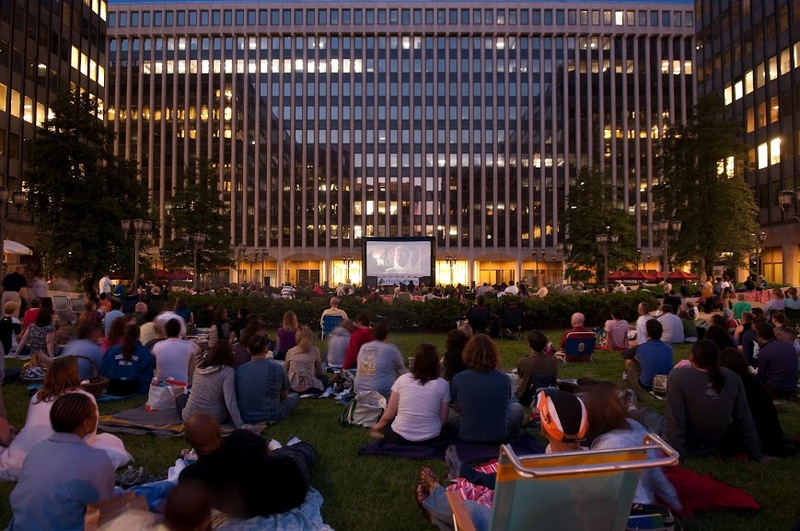 The Golden Cinema Series, shown at Farragut Square, can make for a very convenient after-work date. Taking place every Friday beginning at 7:30 p.m., the Golden Cinema Series began on May 23 and runs through June 27. 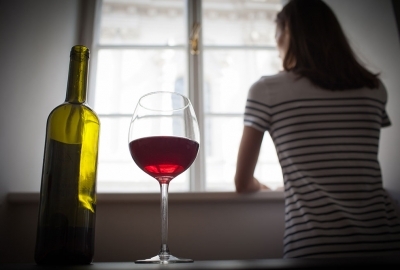 Each evening begins with a screening of an original short film courtesy of DC Shorts. The next screening is this Thursday with Mr. Smith Goes to Washington. The short film being shown is Luminaris. The rest of the schedule includes Dave on June 6 with short Ouverture, My Date with the President’s Daughter on June 13 with short The Mouse that Soared, Legally Blonde 2: Red, White, and Blonde on June 20 with short Expiration, Annie on June 27 with short Floyd the Android in Transporter and American President on July 11 with short Pigeon Impossible. The cinema series has teamed up with neighborhood restaurants and is offering dining specials for the duration. Ristorante i Ricchi will be serving up a Golden Reel happy hour on the patio including complimentary hors d’ouvres and special cocktail pricing when saying, “Golden Reel” upon your arrival. Other participating restaurants include BLT Steak, Edgar Bar & Kitchen, Equinox, M Street Bar & Grill, and Morton’s the Steakhouse. 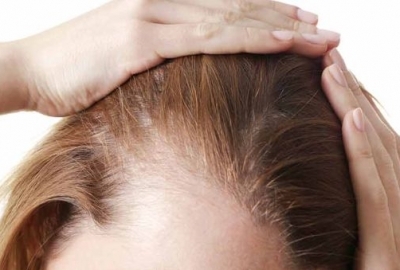 For full details, visit the series’ website. During the summer months National Harbor presents Movies on the Potomac, classic movies on Sunday evenings on the Plaza’s big screen. The 2014 season runs from May 25-Sept. 28. Films begin at dusk, usually around 8:30 p.m. Parking is $2 per hour up to a $10 maximum. Coolers are not permitted. The remainder of the schedule includes Finding Nemo on June 1, The Incredibles on June 8, Father of the Bride on June 15, The Parent Trap on June 22, The Princess Diaries on June 29, Freaky Friday on July 6, The Wizard of Oz on July 13, Willy Wonka on July 20, Annie on July 27, Singing in the Rain on Aug. 3, Goldfinger on Aug. 10, From Russia with Love on Aug. 17, Dr No! on Aug. 24, You Only Live Once on Aug. 31, Finding Neverland on Sept. 7, Peter Pan the 1953 version on Sept. 14, Peter Pan the 2003 version on Sept. 21 and Hook on Sept. 28. 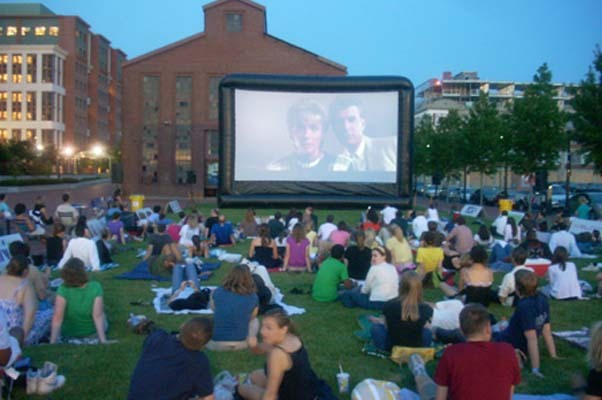 NoMa Summer Screen started Wednesday and will take place every Wednesday starting at 7 p.m. through Aug. 13. Located at Loree Grand Field, 250 K St. NE, NoMa Summer Screen will feature some great movies with the theme “Unlikely Friendships” this summer. Food trucks Popped! Republic, The Big Cheese, TaKorean, Red Hook Lobster Pound, Dangerously Delicious Pies, DC Empanadas, DC Slices, Pleasant Pops, KaftaMania, BBQ Bus, Captain Cookie & the Milkman, Pho Wheels DC, Astro Doughnuts & Fried Chicken, Crepe Love, Orange Cow, Shake Shack, Doug the Food Dude and SUNdeVICH will rotate each week to grab a bite. The next movie screening will be June 4 at 7 p.m. with Silver Linings Playbook. 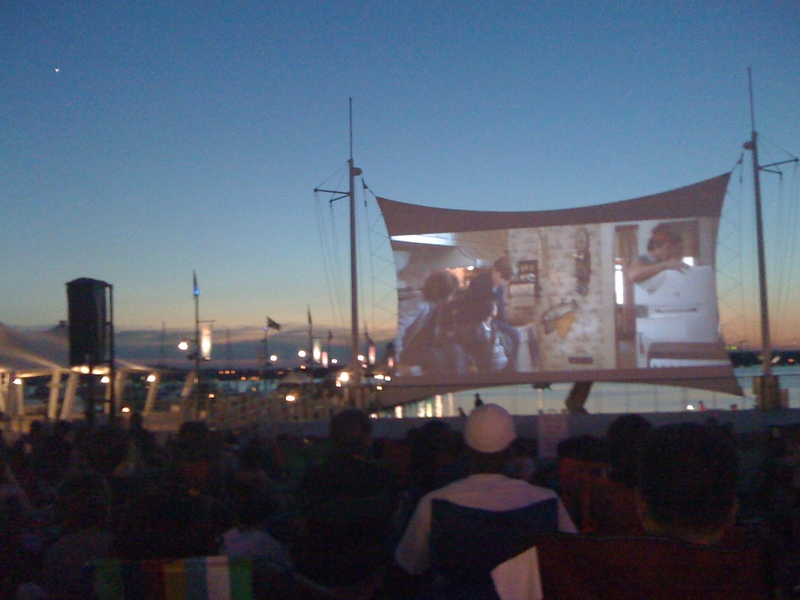 Other movies being shown at NoMa Summer Screen are Midnight in Paris on June 11, Up on June 18, When Harry Met Sally on June 25, Clueless on July 2, The Muppets on July 9, The Perks of Being a Wallflower on July 16, The Dark Knight on July 23, Pitch Perfect on July 30, Top Gun on Aug. 6, The Sandlot on Aug. 13 and a rain date on Aug. 20 if any of the films are rained out. 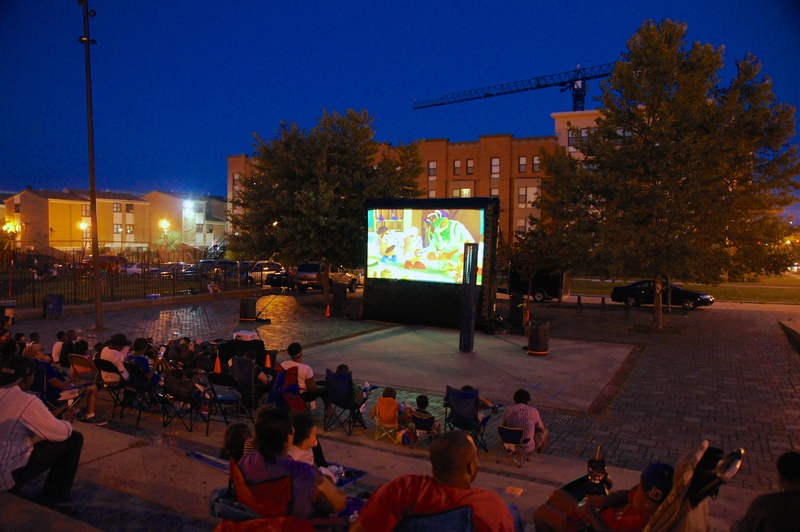 The NoMa Business Improvement District also sponsors a Family Film Night also with the “Unlikely Friendships” theme in the plaza at L and First Streets NW on four Tuesdays. The lineup includes WALL-E on June 24, Frozen on July 8, The Lego Movie on July 22 and Despicable Me 2 on Aug. 5. The event starts at 7 p.m. with kid-centric activities and free food. Films start at sunset. This year’s Rosslyn Outdoor Film Festival features movies about work. If you’ve ever had a bad boss, a crazy co-worker, or a group of colleagues who can lighten your mood in the most stressful of times, then you’ll relate to these movies. Shown in Gateway Park at 1300 Lee Highway, screenings start at 8 p.m. beginning tonight. This year’s lineup includes Office Space on May 30, The Devil Wears Prada on June 6, Horrible Bosses on June 13, Thank You for Smoking on June 20, Two Weeks Notice on June 27, The Internship on July 11, How to Lose a Guy in Ten Days on July 18, Up in the Air on July 25, 9 to 5 on Aug. 1, Empire Records on Aug. 8, Miss Congeniality on Aug. 15 and Anchorman on Aug. 22. Admission is free and parking is $3 after 6 p.m. at Atlantic Parking Garage on Moore Street. Bring blankets, low chairs and a picnic. Arrive early for best seating, pre-show games and prizes. Outdoor movies make for a great date because it is time you can spend with your significant other cuddling up and watching a movie while taking in some fresh air. Don’t forget to pair that movie with some dinner to make for the perfect summer date.